Looking for a unique, historical angle on the Mexican-American War? Ever wondered when American war journalism “began”? “War With Mexico! 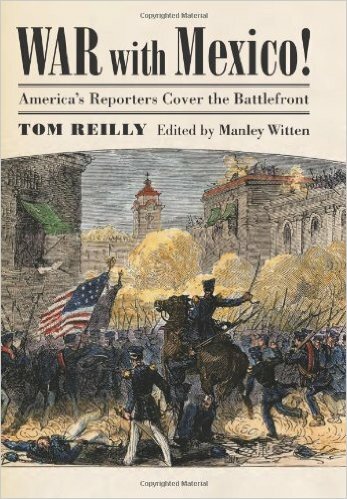 America’s Reporters Cover The Battlefront” by Tom Reilly, edited by Manley Witten is an excellent book to add to your bookshelf (or borrow from a library). The text explains the communication avenues and news processes in 1840’s America, details New Orleans’s key role in spreading war reports, and introduces real letter writers, war correspondents, and reporters who went with Taylor and Scott’s armies. It shares excerpts from the original reports and reveals what the American citizens knew about the war and exactly how that news got to the homefront. The amount of time it took for a report to get from Mexico to New Orleans, and how during the two years of conflict communication became faster. Each reporter wrote what he saw and knew, which sometimes created vastly different perspectives on the same battle. For the first time in U.S. history, journalists worked with the military to compile casualty lists which will be printed in national newspapers. Politics played a huge role in the press. It was fascinating to see how reporters praised or discredited Scott and Taylor, knowing that one – maybe both – would probably run for president. Groundwork for the next election was literally made on a real campaign trail. The writing styles. As a writer, I appreciate other authors’ skills and voice. There are quite a few excerpts in the book by different 1840’s reporters; their voices and what they chose to focus on varies, creating some unique “American” journalism. How many people read (and wrote) during the 1840’s! At some camps, newspapers were published with military news, local gossip, and rumors just to give writers and readers something to do. The Mexican-American War ushered in American battlefield reporting, which would become even stronger and influential during the Civil War. Many of the challenges, censorship, and difficulties faced (or caused) by these war journalism pioneers have increased through the decades and remain questions of today. If you’re a “Civil War nut” (that term is used with great camaraderie, and not meant to offend!) then you’ll enjoy the brief appearances of Davis, Lee, Jackson, Grant, and other famous names as they start their military careers in the U.S. Army. The book didn’t mention any reporting on what going on in California. How were the eastern papers getting that news? Or maybe they weren’t? Perhaps something to research or consider. The text focuses only the actual war in Mexico, but does an admirable job on that subject. I’d highly recommend “War With Mexico!” for readers interested in the 1846-48 conflict, journalism, or 19th Century American society. It is also a helpful prologue for approaching the reporting in the 1861-65. In the words of Robert E. Lee, commenting generally on the relations between the army and press: “We are our own trumpeters, & it is so much more easy to make heroes on paper than it is in the field. For one of the latter you meet with 20 of the former, but not till the fight is done.” (1847) Crafting heroes, reporters in the Mexican War influenced America in startling and unforgettable ways. University Press of Kansas, 2010. This entry was posted in Book Review, Mexican War, Newspapers and tagged Book Review, journalism, Mexican War, Newspapers, Reporters, Robert E. Lee. Bookmark the permalink.